Not all businesses have the same needs. 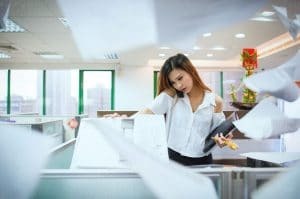 We talk about tips for printing and copying a lot here at Copier Charlotte, but that’s not always what people need. For some business scanning is the most important feature, and they need to know how best to utilize their machines. That’s why this week we are talking about tips to help you scan like a pro. If you work at a company that scans extensively then you need to make sure you are set up to handle that as best as you can. This begins with getting a machine that can handle the load you need it to handle. For example, small desktop scanners can do about 10 scans per minute. This is fine if you are a small business, but large operations have greater needs. That’s why they make full scanners that are able to crank out over 1000 scans an hour. Getting the right machines can totally change how productive you are. You should also consider getting an automatic document feeder for your machine. This will allow you machine to automatically grab and scan your paper without any human interference. This can drastically change how many scans you are able to complete per hour. Another helpful option to consider is to get a metal detector for your machine. This can help your machine notice any paper clips or staples that may be in your paper. These pieces of metal can cause big issues in your machine and make you pay for expensive repairs down the road. To get the best in scanning solutions you should call us today at Copier Chicago. We can get you supped up with the best technology to help you scan like a pro.